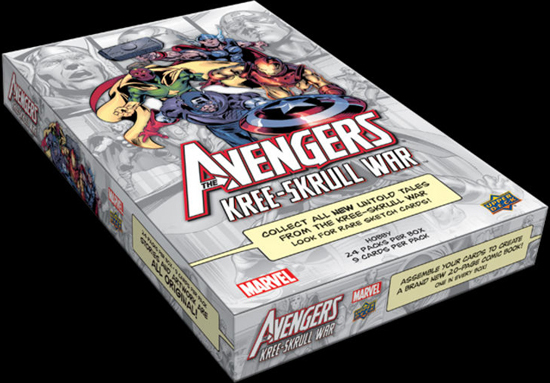 We have shared information he on the Upper Deck Blog about our new Marvel product; “The Avengers: Kree-Skrull War.” We have even given you a peek at some of the sketch cards you can find live in packs. But what we haven’t done is actually shown you what it is like to open a box of the product. Luckily our friends at Beckett Media have spent a little time doing just that. Take a look at some of the things you can look forward to when you open your box of “The Avengers: Kree-Skrull War. Beckett Media staff also had the chance to spend some time with Bubby Johanson, associate product manager for Marvel products here at Upper Deck. Take a look at this exclusive Q&A to find out a bit more about this very unique product by clicking here. Put together the untold story of The Avengers during the Kree-Skrull War when you open your box and enjoy a new type of comic experience! Do they still have these?